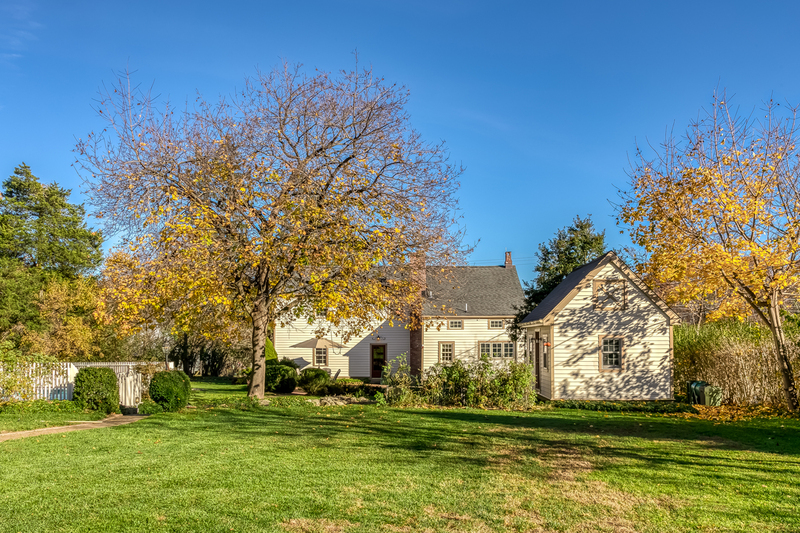 This thoughtfully-preserved, 18th century saltbox colonial style home sits on 4 acres of open backyard with wooded borders in the historic Fairmount section of Long Valley (Washington Township, Morris County). 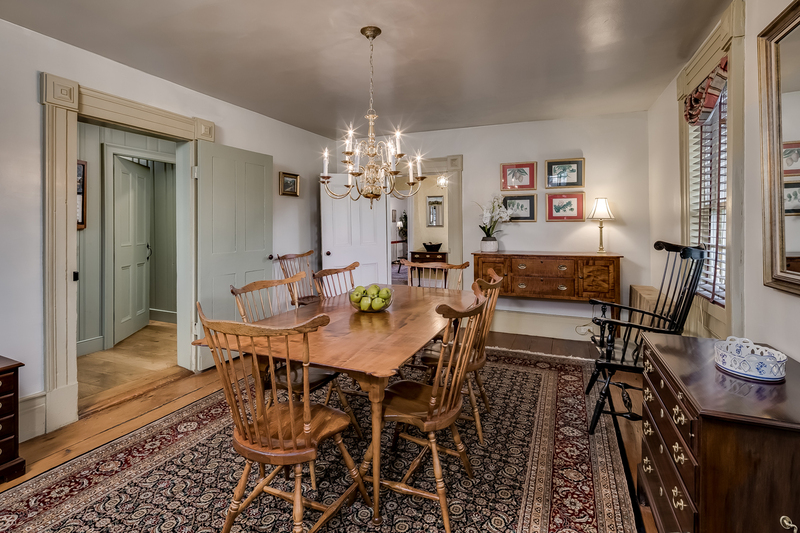 Oriented to maximize appreciation of its bucolic natural setting from inside and out, this home is perfect for a buyer who is looking for a property with genuine historic charm coupled with the practical functionality of modern amenities. The floor plan of the home flows well for day-to-day living while affording the spaces required for family gatherings and entertaining. 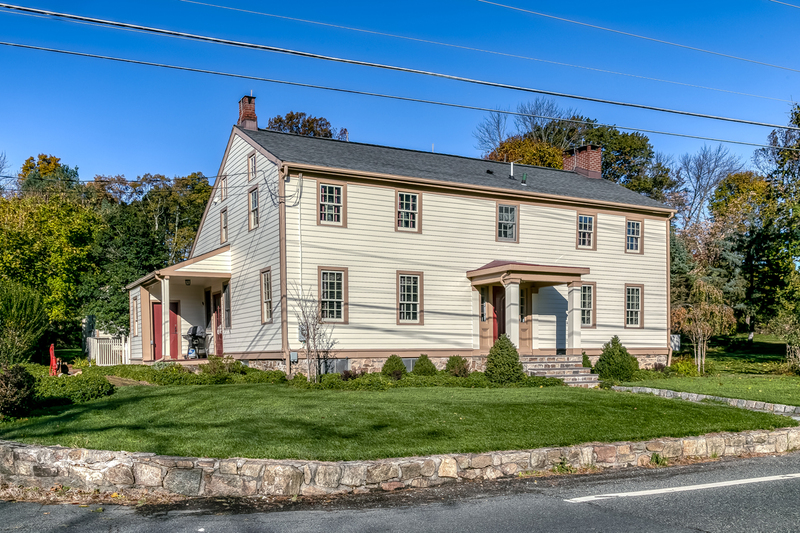 Original wide-plank floors, a wood-burning stove and 3 additional decorative fireplaces, a “Jersey winder” staircase, built-in bookcases, double-hung windows with true divided-light/muttons, and original and reproduction moldings throughout the home underscore its traditional colonial styling which is blended with numerous modern conveniences including an updated, gourmet kitchen and updated bathrooms. 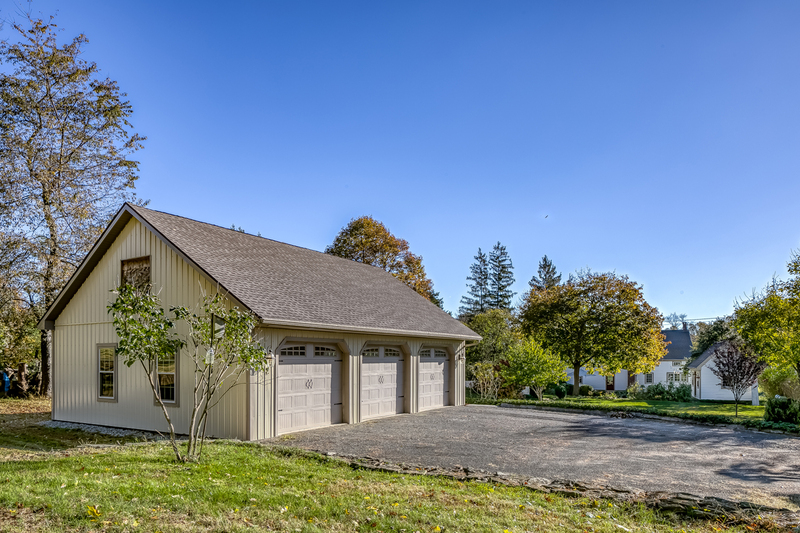 The home has abundant natural light throughout the day and offers beautiful vistas of the landscaped and natural areas surrounding the property. Visitors are welcomed to the home by way of an brick walkway and enter into the large center hall through a wood and glass panelled door with matching wooden storm door. 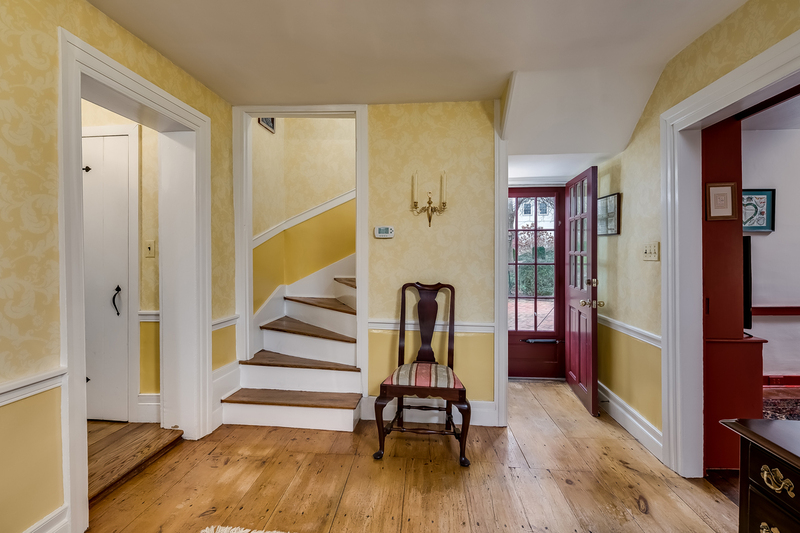 The hall has an antique wide plank pine floor and connects to all other areas of the home and leads to the kitchen through a hallway with pantry/coat closets. 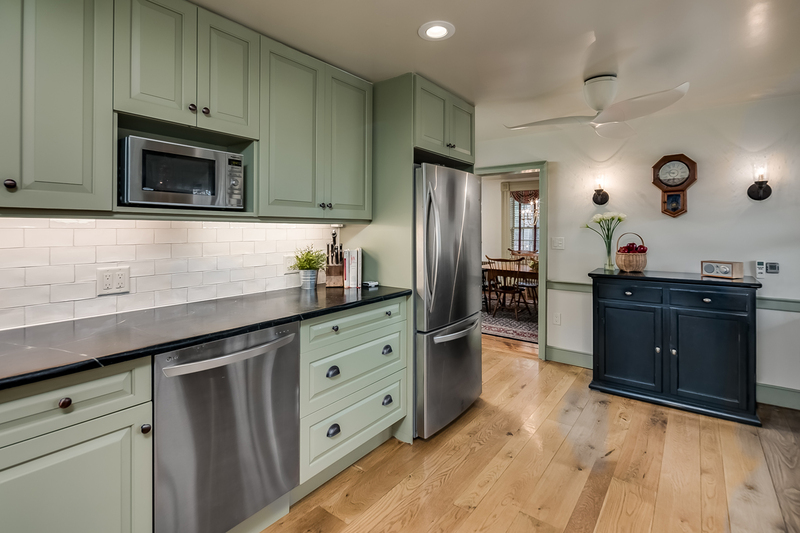 The recently-renovated (2014) kitchen features oiled soapstone countertops with an oversize soapstone farmhouse-style sink, painted solid wood cabinetry with extensive, thoughtfully designed storage areas, and updated appliances including a stainless steel LG refrigerator, FiveStar 36” stainless steel gas 4-burner range with griddle and a high velocity stainless steel ventilation hood, LG stainless steel dishwasher and refrigerator, and wide plank oak floors. 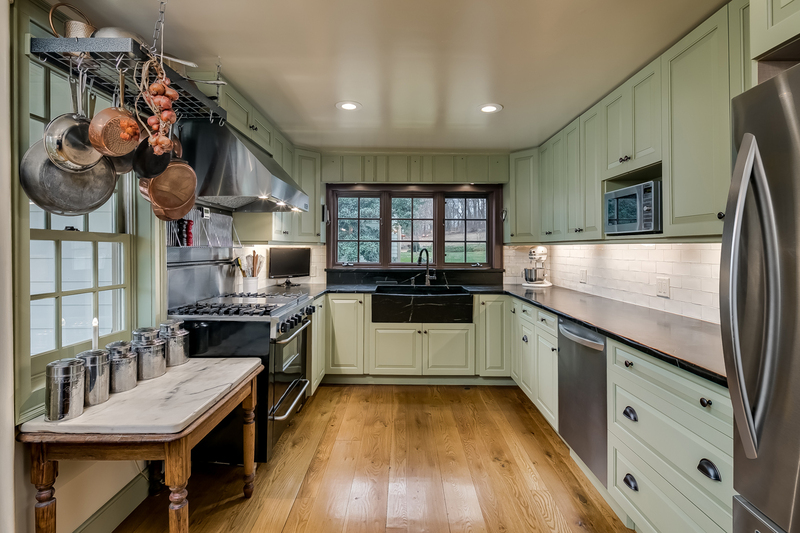 The kitchen is connected to a sunny, south-facing covered side porch through a wood-and-glass door and is also connected to the dining room. 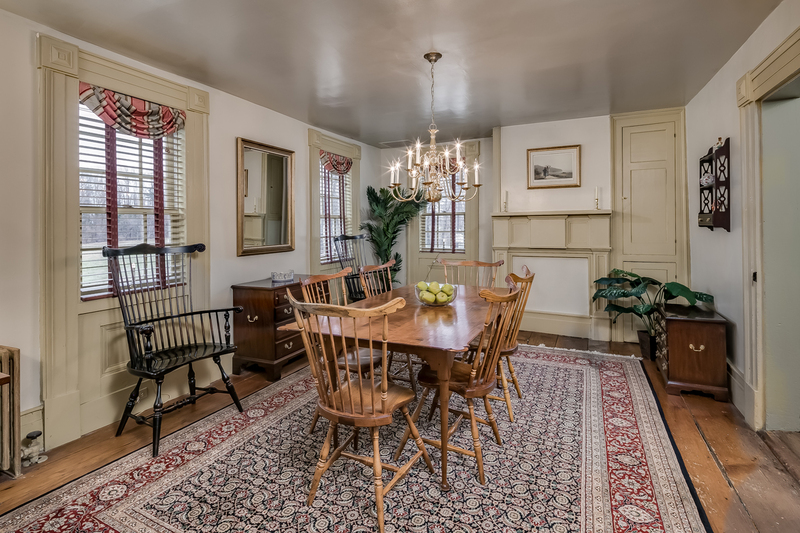 Located at the southeastern corner of the house, the dining room is large enough to accommodate a large table as well as additional furniture. 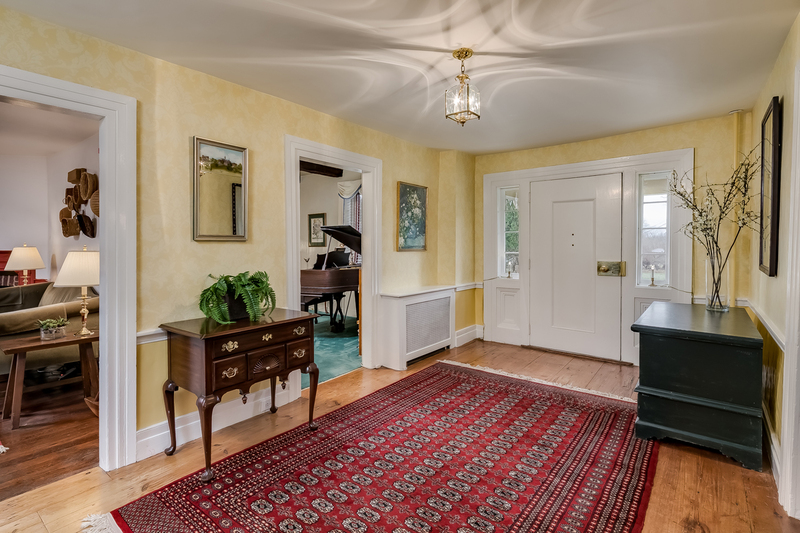 Its millwork and cabinetry are the most grand in the house, with wainscoting detail under the windows, decorative bosses at the corners of the window trim, antique wide plank pine floors, and a decorative mantle flanked by built-in storage cabinets. Across the foyer from the dining room is the east-facing living room with its beautiful brick fireplace and antique wood mantle, hand-hewn beams, and plaster-over-lath walls painted with a gloss paint to accent the texture of the hand-rendered walls. Adjacent to the living room is the home’s family room which overlooks the brick patio and backyard of the house. 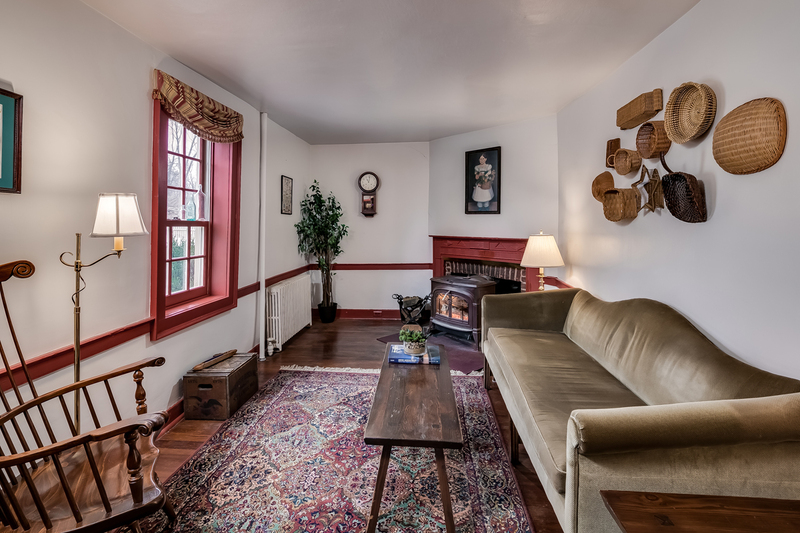 A Vermont Castings wood-burning stove nestled into a brick fireplace with antique wood mantle, wood floors, and built-in shelves and cabinetry make this one of the coziest rooms of the home. It ’s also a room that could be converted to a bedroom if there were a need for a first floor bedroom. 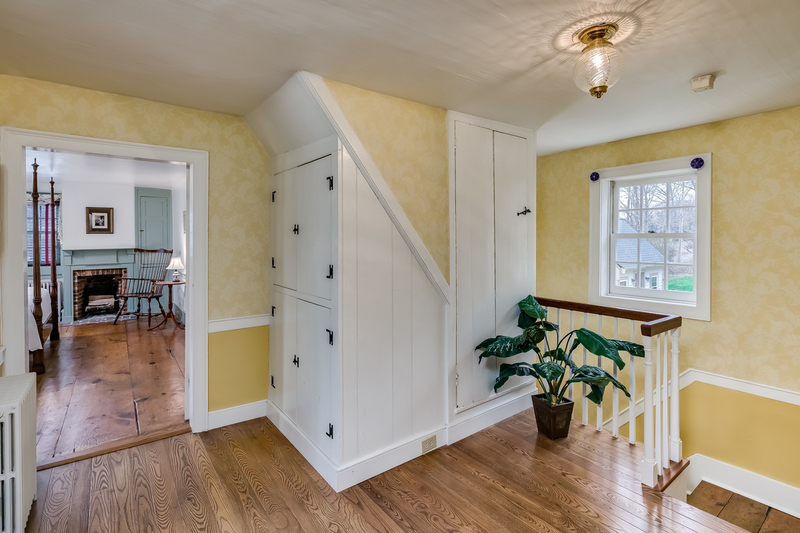 Completing the first floor are a laundry room and a powder room adjacent to the kitchen. 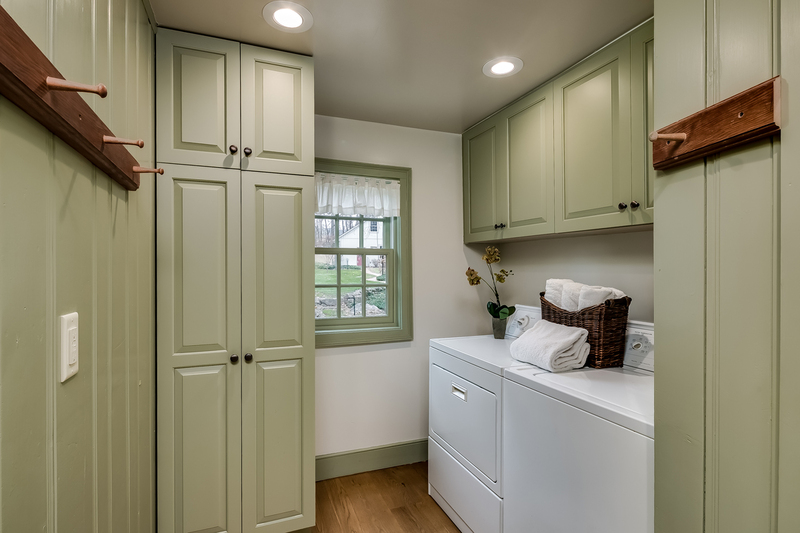 The large laundry room features floor-to-ceiling painted dimensional paneling with coatpeg railing, side-by-side washing machine and electric dryer under overhead cabinets, and a pantry-style cabinet. 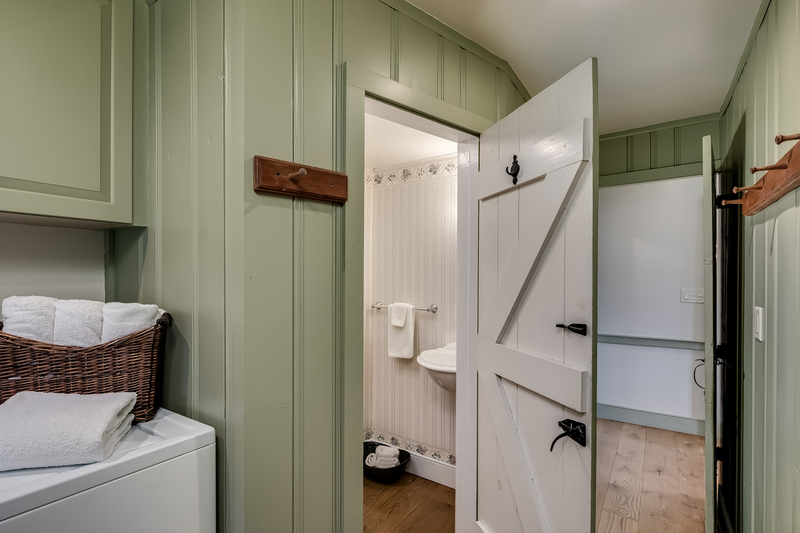 A discreet door provides convenient access from the laundry room to the powder room which could easily be expanded if there were a need for a full bathroom on the first level of the home. 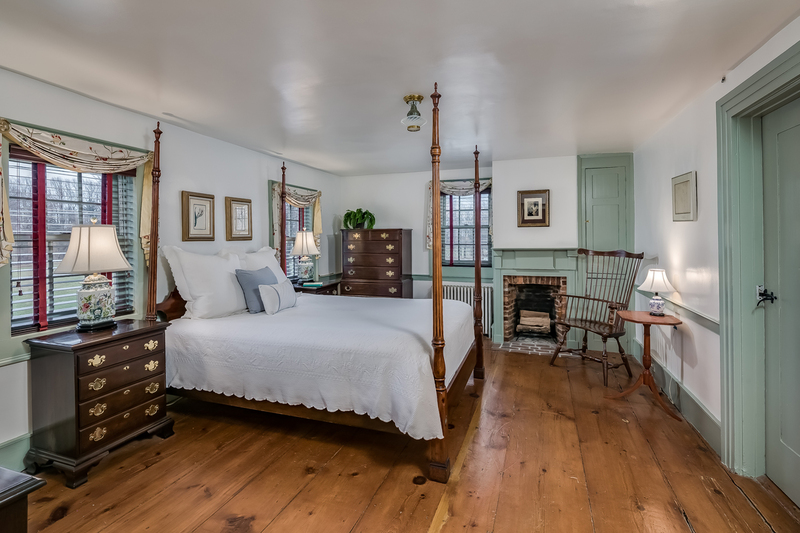 Upstairs, the second floor center hall gives access to the bedrooms and main bathroom of the house, as well as the attic. 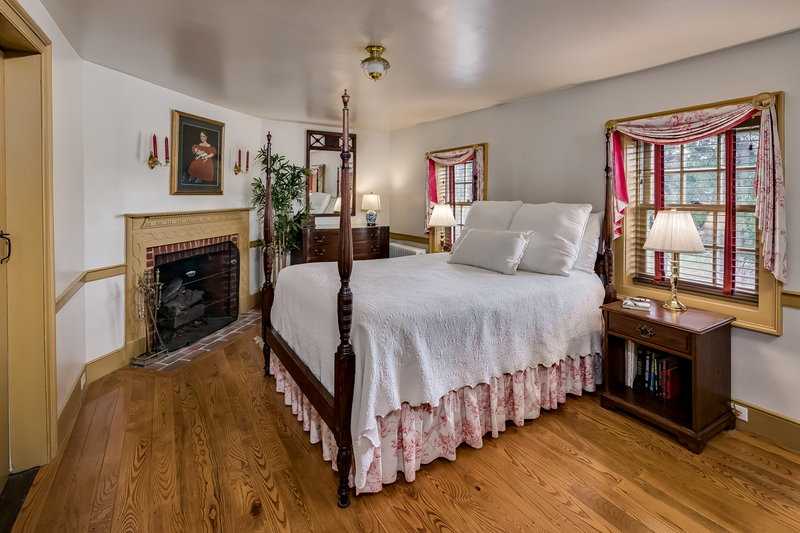 The master bedroom features a sitting room (formerly used as the home’s fourth bedroom) with en suite bathroom, wide-plank pine floors, and a decorative brick fireplace with wood mantle. The master bathroom was renovated in 2014 and features white tilework walls, decorative black and white tile floor, a large white tile tub/shower with sliding glass doors, painted wooden double-vanity topped with a grey marble counter, and two undermount ceramic sinks with nickel faucet sets, all highlighted by recessed accent lighting. 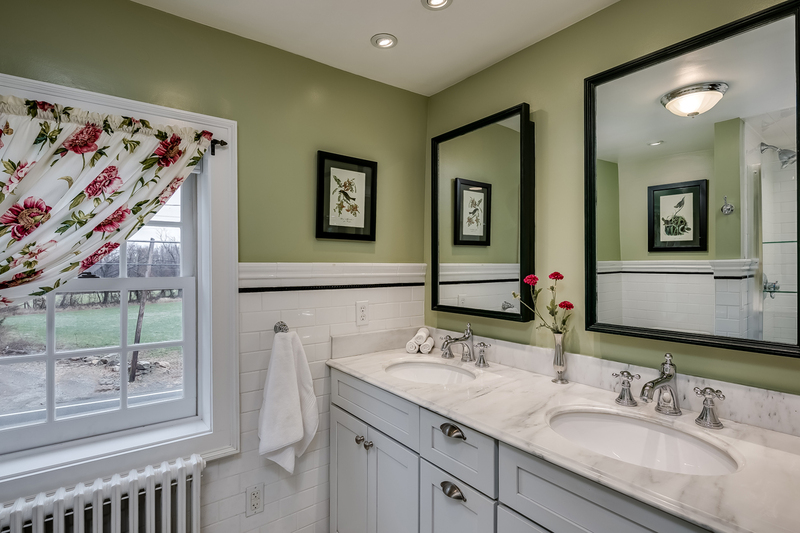 Large mirrors with wooden picture-frame style frames are mounted above each sink. A large walk-in storage room off the sitting room completes the master bedroom area. 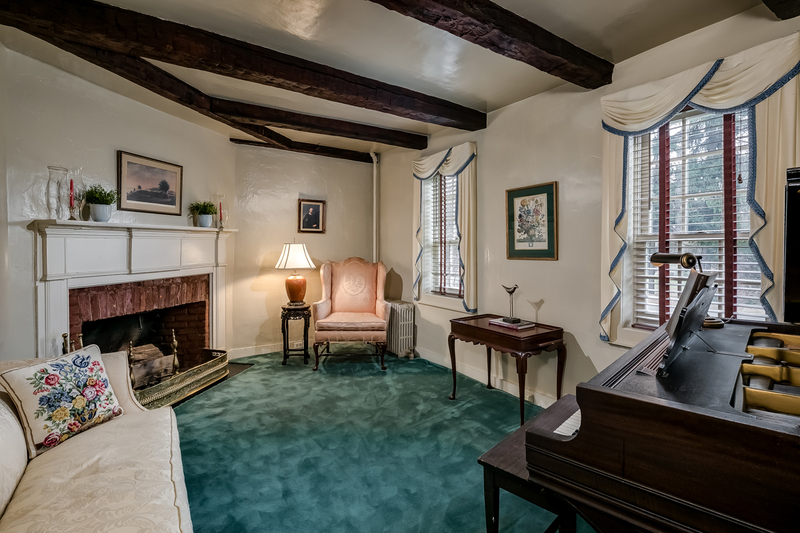 A second bedroom features ash floors and decorative brick fireplace with antique mantle. The third bedroom of the home (not currently featured in photographs) features original wide board floors and a closet. 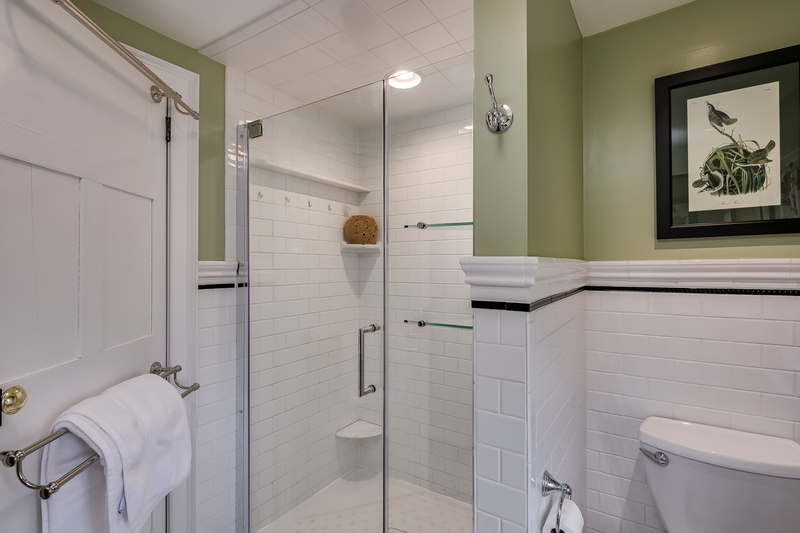 The main bathroom of the home was renovated in 2007 and features finishes mirroring those of the master bathroom: white subway tilework walls, decorative black and white tile floor, a large white tile stall shower with rimless hinged glass door, painted wooden double vanity topped with a grey marble counter, and two undermount ceramic sinks with nickel faucet sets highlighted by recessed accent lighting. 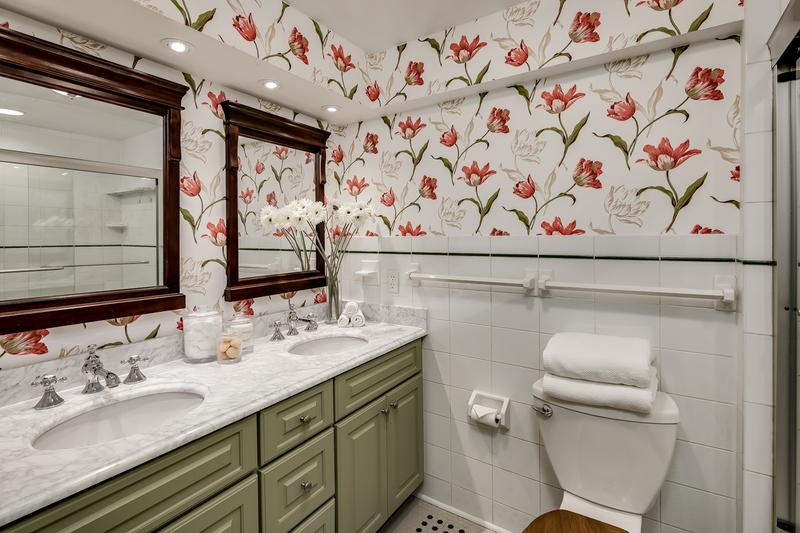 Above each sink is a picture-framed mirror/medicine cabinet. Accessed from the exterior kitchen porch, the unfinished basement serves as the home’s utility room and also includes room for storage. 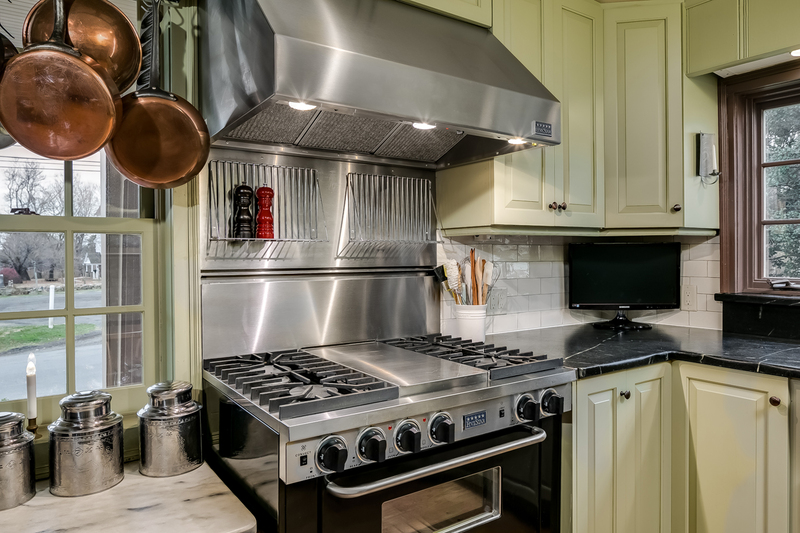 Systems of the home include an oil-fired steam radiator heating, 200 amp electrical service, smoke detectors, carbon monoxide detectors, and fire extinguishers. An above-ground oil tank is located in the basement. 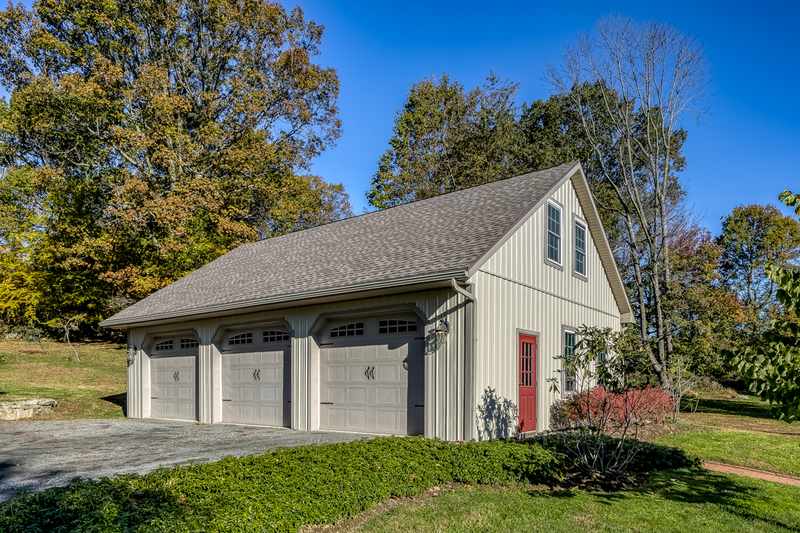 The exterior of the home expands the possibilities for living space and recreational enjoyment of the property with hardscaping and perennial gardens. A large, brick patio accents the back of the house, providing plenty of space for an outdoor dining table, lounge chairs, and planter pots. 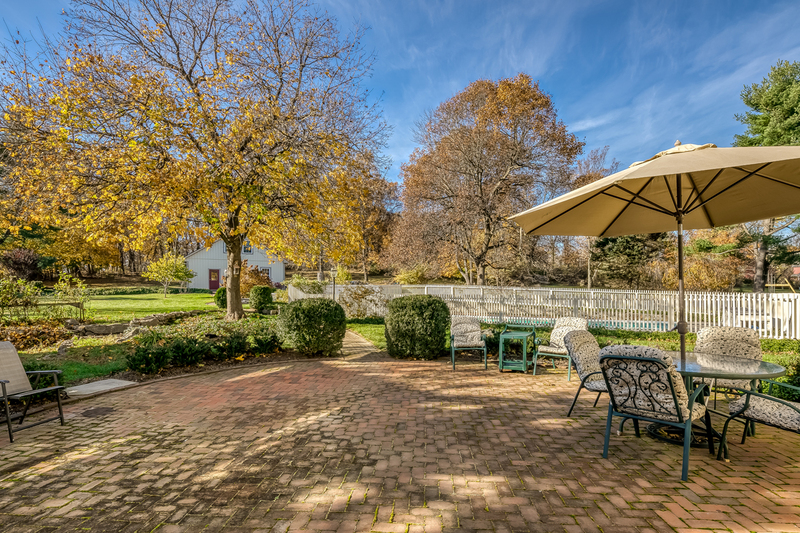 It is connected by way of an edged brick walkway to the 20×40 pool which is accented by stone walls, landscaped garden beds, lattice storage bench, and wooden picket fence. 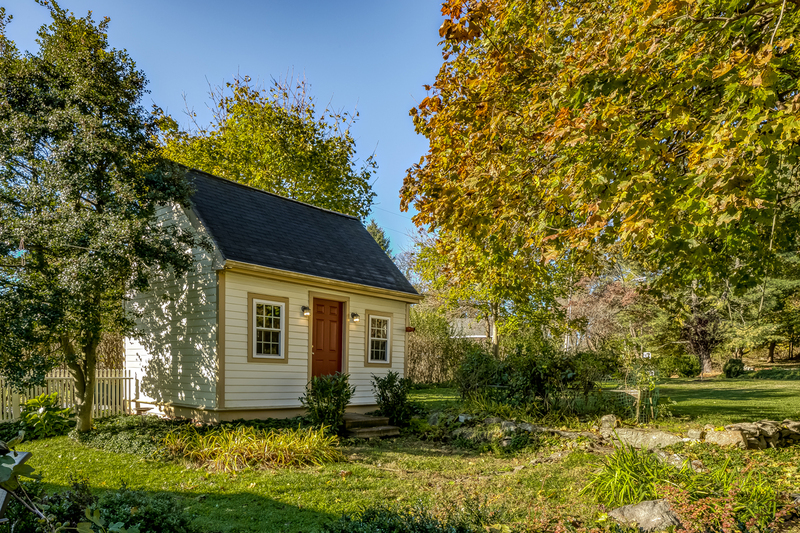 A 12×16 Colonial Williamsburg style outbuilding with multiple electrical outlets serves as a garden shed, workshop, or studio space. A winding brick walkway leads from these features 30X40 three car garage which has a wooden staircase leading to the finished second floor loft space. Outside the garage, a fine gravel parking area provides parking for several cars. The siting of the improvements of the property leave significant amounts of open and level acreage which could be fenced and on which horses, sheep, alpacas, or other livestock could be kept. 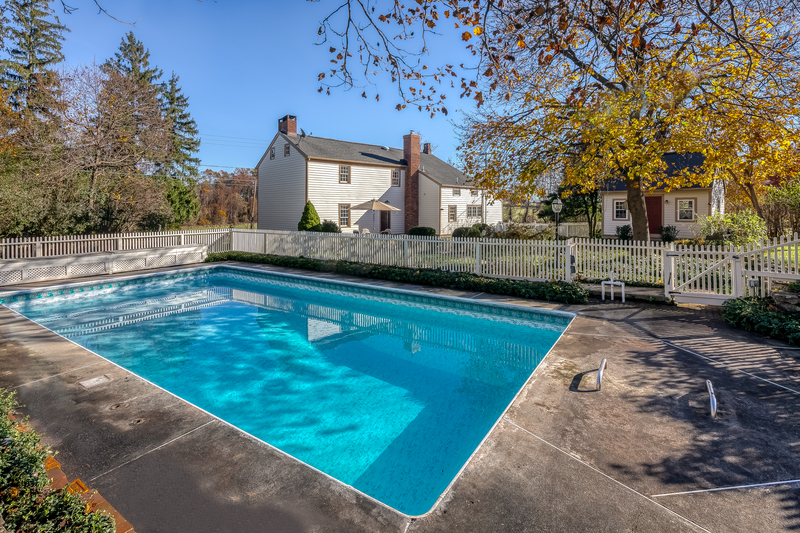 The property is located in the heart of the Fairmount Historic District of Washington Township — an area of Morris/Hunterdon County renowned for its natural beauty, history, and rich agriculture. Nearby outdoor recreation areas include Christie Hoffman Farm Park and its extensive equestrian and walking trails, Ken Lockwood Gorge — a favorite location for trout fishing, the dog-, horse-, cyclist-, and runner-friendly Columbia Trail, and Round Valley Reservoir. It is served by Old Farmers Road Elementary School, Long Valley Middle School, and very highly-rated West Morris Central High School, and is convenient to private schools including Gill St. Bernard, Pingry, Far Hills Country Day, and The Willow School as well as nearby shopping, golf courses and country clubs (Hamilton Farm, Fiddler’s Elbow, Trump National). Commuter highways (Interstates 78, 80, and 287) and TransBridge Line buses and NJ Transit trains allow for convenient access to New York City and Newark Liberty International Airport as well as smaller, regional airports.